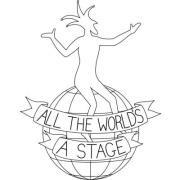 The latest production by Guildford based Theatre Company All the World’s a Stage – Once Upon a Midnight Dreary – was conceptually brilliant but poorly executed. The production was based on the writing of Edgar Allen Poe and provided an adult alternative to the Halloween celebrations. It lasted for an hour and the performance took place in Guildford’s Racks Close. The meeting point was the stunning Boatman Public House on the river Wey where the audience enjoyed pre (and post) show drinks. At 7:45pm they were met by one of the actors and led to the steeply banked land of Racks Close, an old chalk quarry site. At the entrance an actor recited The Raven, surrounded by fiery torches which were to provide the only source of light during the performance. The vocal delivery was superb and set the tone for the evening. This atmospheric opening was only hampered by the noise and headlights of passing cars. The audience followed the cast of 5 to the first of three “stations”. At each station a different tale from the Poe repertoire was performed. The three tales enacted by the troop were ‘The Facts in the Case of M. Valdemar‘, ‘The Pit and the Pendulum‘ and ‘The System of Doctor Tarr and Professor Fether‘. The scenes were largely narrative in nature with clunky dialogue, little action or visual interest. Efforts to utilise the original text were evident but significant editing would have been needed to transform the text into a theatrical presentation. Luckily the vocal performances were strong and engaging for the most part. An exception to this would be the American accent of the only female performer. As the rest of the company delivered the heavily stylised dialogue in English accents there appeared little justification for her Southern American drawl which was distracting at best and grating at worst. Although the promenade staging was an inspired choice a major drawback was the expectation that audience members stood for the duration. An hour in the cold made this too long and reduced interest in the quality of the performance and audience members became increasingly restless. A suggestion on the ATWAS website that people provide their own stools or fold out chairs or the provision of benches for the small audiences at each station would have eliminated this problem. Two audience members complained of feeling faint during the second tale and one had to be removed for the remainder of the performance. The setting did not make this easy as an audience member could not simply walk away due to the poor lighting and uneven ground but had to be escorted by an actor bearing a torch. Of the three tales the System of Doctor Tarr and Professor Fether was the most engaging with a much stronger focus on character development however as with the other two, it was too long and most audience members had identified the twist long before it was revealed to them. It was however a gratifying change of pace from the narrative and plodding Facts in the Case of M. Valdemar or the awkward and underdeveloped physical theatre of The PIt and the Pendulum. I last saw ATWAS perform their pub crawl version of A Christmas Carol in December 2012. I really enjoyed their unique storytelling style and use of site specific staging to enhance the experience. Despite the cold today I am looking forward to my second visit to watch the fledgling theatre company perform in honour of Halloween. This time they have taken inspiration from Edgar Allen Poe and it would appear that the performance is entirely outdoor. I am attempting to reserve my judgement for now, about the wisdom of an open air production in October – my ongoing struggle with cold temperatures is only furthur exaggerated in the early months of pregnancy. 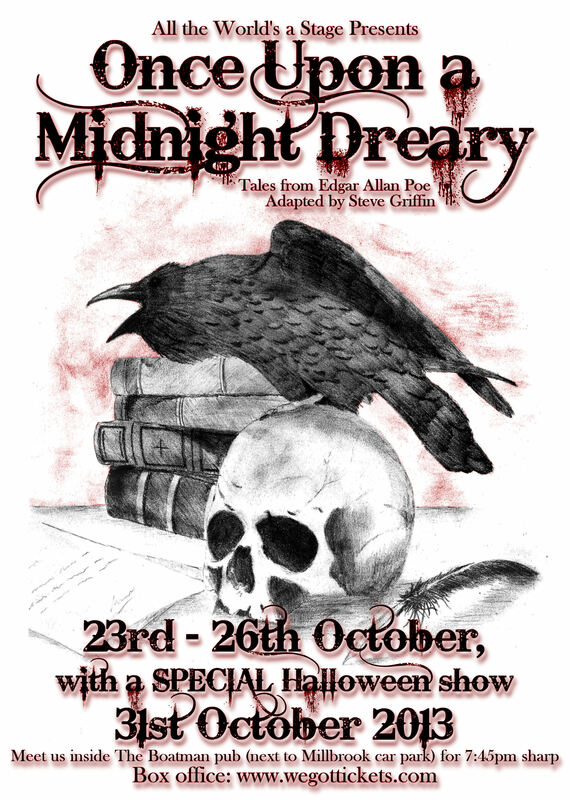 Visionary Guildford theatre company, All the World’s a Stage, have brought the stories of Edgar Allen Poe, the Master of Macabre, to Guildford this Halloween. Tales of mesmerism, murder, torture, and insanity are brought to life in Guildford’s Racks Close, lit only by blazing torches and whatever scant moonlight remains at the end of the lunar cycle. This promenade production meets at The Boatman Pub, where audiences will be met and led to Racks Close. Here, they will find one who has been hypnotised at the point of death, another who is forced by the Inquisition to choose between two terrifying methods of death, and an asylum with a secret. It is always great to try something new and at 34 I am unlikely to go trick-or-treating so here’s to a spooky night with good friends and a warm jacket.